The conclusions reached by the UN Working Group on Arbitrary Detention are decisive: Julian Assange must be freed at once and should be awarded compensation for the arbitrary detention and loss of freedom to which he has been subjected since 2010. The Working Group’s legal ruling considers that “the various forms of deprivation of liberty to which Julian Assange has been subjected constitute a form of arbitrary detention”. In particular, it states that in this case there has been a violation of articles 9 and 10 of the Universal Declaration of Human Rights and of articles 7, 9, 10 and 14 of the International Covenant on Civil and Political Rights. UN statement demanding Assange’s release represents a clear disapproval of the persecution carried out by British, Swedish and US governments against the founder of WikiLeaks, sheltered since June 2012 inside the Ecuadorian Embassy in London. As the Working Group on Arbitrary Detention states, their decisions are based on the International Human Rights Law and their guidelines constitute a model for regional and international legal institutions, including the European Human Rights Court. According to the principles of Podemos, we defend the right of citizens to freedom of speech and access to information as fundamental democratic values. In the exercise of these rights, informants who report irregularities, known as “whistleblowers”, play a fundamental role in disclosing information. Otherwise, citizens would never have access to this information. According to article 19 of the Universal Declaration of Human Rights as well as the International Covenant on Civil and Political Rights, rules must be created to protect these “whistleblowers” in order to build and maintain democratic societies. In a similar direction, David Kaye’s report of September 2015 (http://www.ohchr.org/EN/Issues/FreedomOpinion/Pages/ProtectionOfSources.aspx), UN Special Delegation for the protection of the right to freedom of speech, pointed out the importance of protecting both information sources and “whistleblowers” and included recommendations for governments and international organisations. Podemos reaffirms the need to put an end to the persecution suffered by Assange since WikiLeaks started publishing leaked documents. We believe that the Swedish prosecuting authorities no longer have an excuse to travel to London to interrogate Julian Assange, since he himself has offered to testify and has repeatedly proved that he is willing and ready to fully cooperate with the judicial process. Given the situation, Podemos’ delegation in the European Parliament – MEPs Tania González, Lola Sánchez, Miguel Urbán, Estefanía Torres and Xabier Benito – will send a letter to Jean Claude Juncker, president of the European Commission, demanding that the European institutions implement any necessary action to safeguard Julian Assange’s rights and freedoms, in accordance with the UN panel’s ruling. It is important to remember that several Podemos representatives have visited Assange in recent years: in 2014 Iñigo Errejón, Member of Congress and Political Secretary of the party, and Tania González, party spokesperson in the European Parliament and Secretary of Citizen Rescue. 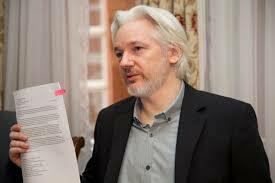 Meanwhile, MEP Miguel Urbán recently visited Assange at the Ecuadorian Embassy on January 4th. Notwithstanding the non-binding nature of the UN panel’s decision, the ruling is extraordinarily relevant since it is the first to be reached by an international organisation that, up until now, had shown a total lack of sensitivity towards the violation of Julian Assange’s rights. Initiatives such as this set an important precedent for the protection of “whistleblowers” when they disclose information that is of public interest or has an impact on the exercise of Human Rights.